We Offer Dental Care Services and Dental Surgery! At American Dental Care of Newark, we realize the value of your healthy smile and take great satisfaction in knowing that our dental care services can transform lives. We have comprehensive experience in cosmetic dentistry, as well as dental surgery, and we take your oral health seriously. 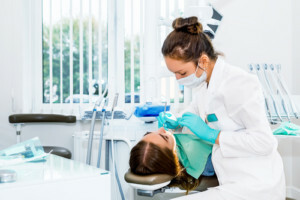 We will carefully evaluate your teeth and bite with the goal of maintaining a beautiful smile and enhancing the quality of your life. Unlike other dentists, we treat patients like family. We’re sure that, after just one visit, you’ll truly appreciate your experience and be amazed by the quality and level of care that you received at our office. We have helped patients from Newark, East Orange and right here in Irvington, NJ! Our oral surgeons will use state-of-the-art techniques to keep your teeth healthy. Whether you are dealing with gum disease, jaw-related problems or a painful infection, we will quickly relieve your discomfort and restore your mouth to optimal health. We also offer tooth extraction surgery, which may result from a broken tooth, severe crowding or extensive decay. Impacted wisdom teeth may also require this procedure. Wisdom tooth extraction is one of the most common dental surgeries that we perform. Many people do not have a large enough jaw to accommodate this third set of molars, which emerges during a patient’s late teens or early twenties. They can become trapped (or impacted) between the gum tissue and the jawbone, causing many painful symptoms. If our staff suspects that a patient’s wisdom teeth will become impacted, it is common practice to remove the teeth before they begin to emerge. You know the old expression: “You never get a second chance to make a first impression.” Your smile is the first thing that gets noticed when you meet someone and can be an excellent source of self-confidence. From parties to day-to-day social interaction, your smile is how you are initially assessed. A stranger’s view of your friendliness, your personality, and even your intelligence are all influenced by the appearance of your smile. Your dental health can affect your self-esteem and even your physical health. Talk to us about your smile. We’d love to understand your goals and what you would like to achieve with your dental health. From dental implants and veneers to Invisalign braces and teeth whitening, we can help you attain the smile you’ve always wanted. Did You Know That We Offer Emergency Dental Services? We are a 24-hr dentist, and our staff is on call every day of the week. If you are experiencing pain, don’t wait! Give us a call right away at 973-453-9088. At American Dental Care of Newark, improving people’s lives through quality and affordable dental care is what we do. Whether you are from Newark, East Orange, or elsewhere in NJ, we might just be the dentist that you need!